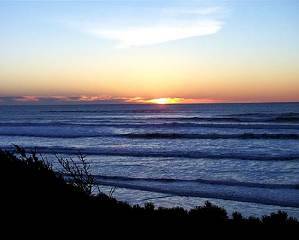 Windside Cottage is an oceanfront, vacation home situated on Oregon’s central coast just south of Newport. Its strategic location provides visitors with a combination of scenic privacy and ready access to Newport’s maritime attractions. 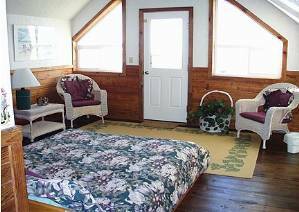 Enjoy the pounding surf from the master suite balcony or stroll down to the ocean from your own private stairway access just outside your door. Ten miles of sandy beach awaits you! 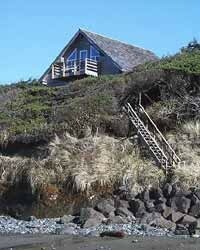 The private beach access stairway is conveniently located fifty feet from the rear door of the house. For the mobility challenged and very young children, access via the walkway at Lost Creek State Park, one quarter mile to the north, may be easier. 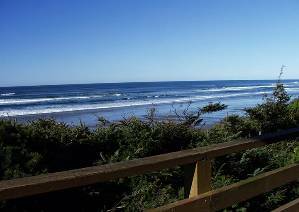 Some of the nearby attractions: The Oregon Coast Aquarium, Mark Hatfield Science Center, Newport's Historic Bayfront, Seafood and Wine Festival, numerous state and federal parks and scenic areas, diverse seafood dining, crabbing, clamming, etc. Oregon (AP) -- Bundled up against the wind and rain, Joan Lynch leaned against the fender of her pickup truck to steady herself and trained her binoculars on the Pacific Ocean in hopes of spotting a heart-shaped spout or a flash of flukes from a passing gray whale. 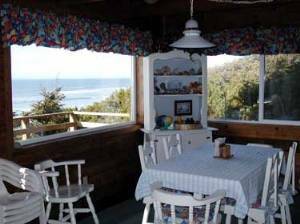 "There's a spout almost all the way out," she said in measured tones from her vantage high on Cape Ferrelo, and immediately conversation stopped and four pairs of binoculars focused on the horizon. "Somebody says 'Spout!' and everybody stops talking and starts concentrating." By an accident of nature, thousands of gray whale families migrate past the Oregon Coast each year on their annual 5,000-mile trek from the Bering Sea to Baja California just when human families are enjoying their Christmas vacation from school. The whales return north during spring break. For 25 years, a network of volunteers like Lynch and her husband, Bob, has taken up their assigned posts on cold, rainy, wind-whipped headlands and in cozy, dry, beachfront resorts up and down the coast to take advantage of that happy coincidence to spread the word. "It's a world-class natural phenomenon you might have missed just for lack of a knowledgeable person pointing in the right direction," said Mike Rivers from his office in Newport, where he coordinates more than 200 volunteers in the Whale Watching Spoken Here program for the Oregon Parks and Recreation Department. "You get this feeling for the excitement of the migration," said Rivers. "They're going to Mexico. They're not bothering to stop or say, 'Hi!' They're going where the water is a little bit warmer and they'll mate and have babies, like they have their whole lives. This whole phenomenon is going on that is just awesome!" The volunteer effort was the brainchild of the late Don Giles, a Sea Grant extension specialist at the Hatfield Marine Science Center in Newport. He noticed the migration-vacation connection in research on gray whale migrations by Oregon State University professor Bruce Mate. "It's just phenomenal how many people, usually about 40,000 individuals, the program touches," said Mate. "Typically, they are reaching people from most states in the union, and very typically three dozen foreign countries. The gray whale is one of just seven species ever taken off the Endangered Species List. That happened in 1994, 59 years after they were protected from commercial whaling, first by the League of Nations and then by the International Whaling Commission. On Cape Ferrelo, Joan and Bob Lynch ignored the wind and rain as they trained their binoculars on the ocean for the telltale heart-shaped spout, formed because gray whales have two blow holes. As many as 30 whales per hour will swim by. Both retired -- he's the former sheriff of Hood River County and she's a former teacher -- they are in their 13th season as whale watching volunteers living out of their fifth-wheel trailer. "They're big and they're beautiful," Bob Lynch said of the whales that keep him coming back. "And there's a mystery to them," added his wife. "There's so much we don't know." "One o'clock, there's a blow!" interjected Linda Carpenter, a computer technician vacationing from Foster City, California. All talking stopped and binoculars were trained on the ocean. "Sleep in, watch the whales, then take the rest of the day off," Carpenter said of her vacation routine. "When you see them come out of the water and breech, it makes it worthwhile for a couple hours of doing nothing." Hiking, biking, golf, tennis, fishing, hunting, wildlife viewing, horseback riding, shopping, restaurants, cinemas, museums, sightseeing, swimming, snorkeling & diving, boating, sailing, water-skiing, surfing, windsurfing, parasailing, jet-skiing, shelling, and rafting. We stayed for the week of Christmas if was fantastic, more then we expected! Fabulous views, clean and all the amenities, there is not one negative thing I could say about our stay. We stayed with our 3 children it was 3 years agao and they still talk about the Christmas in Oregon and when can we go back. 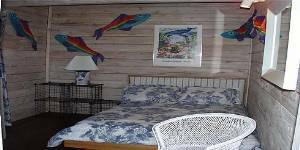 Great location close to harbor,aquarium and shops. We would stay there again in a heart beat! Thanks for the wonderful Christmas memories! 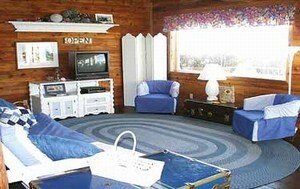 I loved the cottage. 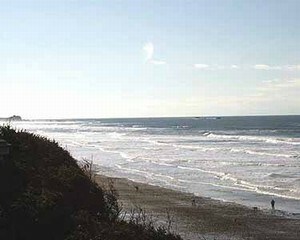 Will stay there again when I'm in Newport! Required Stay: Two night minimum.